Australia's Great Barrier Reef lost nearly a third of its corals in the past year, officials have said. Coral "bleaching" has led to widespread coral decline and habitat loss on the world's largest coral reef system. Surveys show that 29% of corals died in 2016, greater than the figure of 22% projected in mid-2016. The worst-hit area was near Port Douglas, where 70% of shallow water corals died, but there was a recovery of corals in the south of the reef. The latest results come from surveys carried out by the Marine Park Authority, Queensland Parks and Wildlife Service, Australian Institute of Marine Science and the ARC Centre of Excellence for Coral Reef Studies. Great Barrier Reef Marine Park Authority chairman Russell Reichelt said: "As has been the case with reefs across the world, the Great Barrier Reef has experienced significant and widespread impacts over the last two years. "We're very concerned about what this means for the Great Barrier Reef itself and what it means for the communities and industries that depend on it." According to newpaper reports, a meeting over the reef's future was recently told that the federal and Queensland government's long-term plan to protect the reef, announced in 2015, was no longer achievable. Bleaching occurs when the algae living on coral is expelled due to stress caused by extreme, sustained changes in temperature. This turns the coral white. 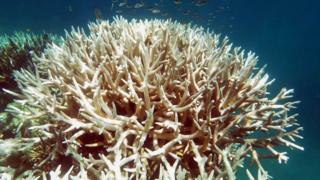 In 2017, further coral die-offs are expected from the second year of bleaching in a row, and the impacts of tropical cyclone Debbie, the officials said. Researchers say that climate change is a significant driver behind the coral loss and experts have said the window is closing fast to cut the greenhouse gas emissions pushing up temperatures and harming the reef.